Recently Google has unveiled a new product Google Takeout which allows the users to download their data stored on most of the Google services. All of your data is downloaded in portable and open formats‚ so it’s easy to import to other services quickly. After the launch of Google Takeout, it is clear that as long as your data is stored with Google, you need not to worry about it. Google provides complete control to its users to manage their data. 1. Open Google Takeout and sign it with your Google account. If you have multiple Google accounts then sign in using that account for which you want to download the data. 2. When you sign in to your account, it will choose all the services. 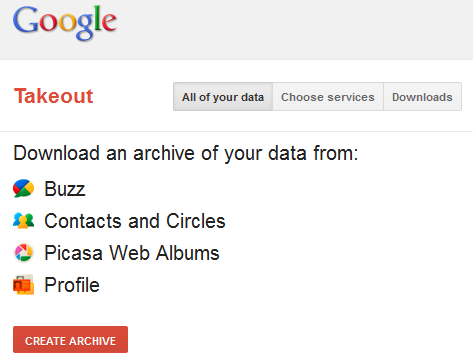 To download data of all the services, click on Create Archive button. If you wish to download data of a particular service say Google Contacts then click on Choose Services tab and select Contacts and Circles. 3. You can also chose any other service. Now click on Create Archive button and it will start downloading your data. It will also you to enter your password before you get the file for download.